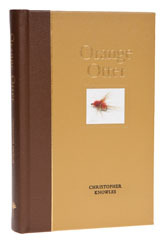 The Reverend Edward Powell only died in 1972 and yet, thirty years after his death, few anglers remember him, or the fly for which he was once so well known, the Orange Otter. Fate is such a fickle thing, but one thing is sure: if there is an afterlife, Powell will be drumming his fingers as he glares down on the world in a state of permanent irritation, because his inability to suffer fools gladly was matched only by his intolerance of fishermen who failed to recognise him. Powell was a sporting parson and having read Christopher Knowles’ book, it is hard to imagine that any church has trained a man more dedicated to the fly rod. Powell caught absolutely phenomenal numbers of trout and grayling, so many at times, that he was banned from various stretches of river and one imagines he was only protected by his office from the baser tendencies of other members of the clubs to which he belonged. Much of Powell’s success was based on a series of killing patterns that he designed and adapted; these were perfectly suited to the rough streams of the borders and he fished them like a man possessed, usually giving the majority of his basket to his parishioners. But when Powell died, his flies faded with him, although the Orange Otter deserves better, given that it is an extremely effective grayling pattern. Border fly fishing has a history all of its own, inevitable in an area with such unique characteristics and a brook around every corner. Its scope is small, but the area has bred some powerful figures, like Cutcliffe and Powell; we are lucky to have such an exhaustive biography of one of them. The flies are illustrated in black and white, if a trade edition appears it would be nice to see them in colour.